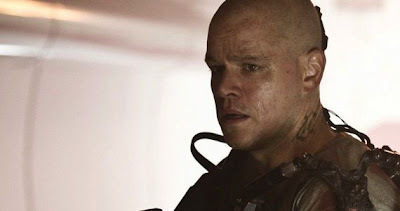 k-rated: Elysium Trailer Is Finally Here! "I need to get to Elysium." The trailer I've been waiting for has finally arrived! Sony/Columbia has just released the highly anticipated trailer for Elysium, starring Matt Damon plus Jodie Foster and directed by Neill Blomkamp of District 9, (which was a stellar movie by the way). I've only read about this and seen a few photos, but now we get a first look into the futuristic world Blomkamp has created. The sci-fi nerd in me loves this kind of stuff. And while this story has been done before, it still has some fresh and innovative ideas. Remember this Summer is full of remakes, reboots, sequels, and prequels, so it's nice to see something new(ish) on the horizon. You'll definitely want to check this out! Elysium is a story set in the year 2159, about Secretary Rhodes (Foster), a hardened government ofﬁcial, who will stop at nothing to enforce anti-immigration laws and preserve the luxurious lifestyle of the citizens of Elysium. However, that doesn’t stop the people on Earth from trying to get in, by any means they can. When unlucky Max (Damon) is backed into a corner, he agrees to take on a daunting mission that if successful will not only save his life, but could bring equality to these polarized worlds. Be sure to look for this movie on August 9th. HECK YES! Love Matt Damon! I hope it’s different. From the outset, it appears to be rather vanilla. One society gets pooped on and lives in the slums, while the other group lives in the lap of luxury with all their wants taken care of. This has certainly been done before. We saw this last year in Total Recall. Meh, we'll see. Looks cool. Let's just hope it IS cool. That does look awesome. I wanna see it!